You can add a reference line to any continuous axis. 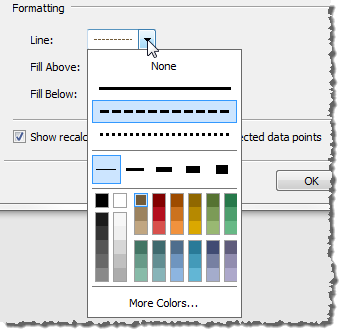 In the Add Reference Line, Band, or Box dialog box, select Line. Select a measure from the Value field to use as the basis for your reference line. You can also select an existing parameter, or create a new parameter on the fly. You cannot select a measure that isn't currently in the view as the basis for your reference line. 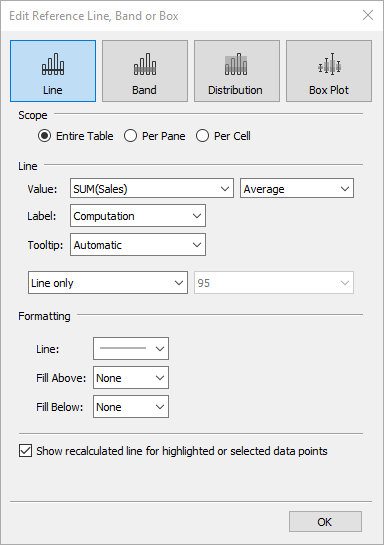 If this is what you want to use, close the Add Reference Line, Band, or Box dialog box and then drag the measure you want to use from the Data window to the Details target on the Marks card and change the aggregation if necessary. This will not change the view, but it will allow you to use that measure as the basis for your reference line. Now re-open the Add Reference Line, Band, or Box dialog box and resume at step 1, above. Average - places a line at the average value along the axis. Constant- places a line at the specified value on the axis. Maximum - places a line at the maximum value. Median- places a line at the median value. Minimum - places a line at the minimum value. Sum - places a line at the SUM of all the values in either the cell, pane, or entire view. 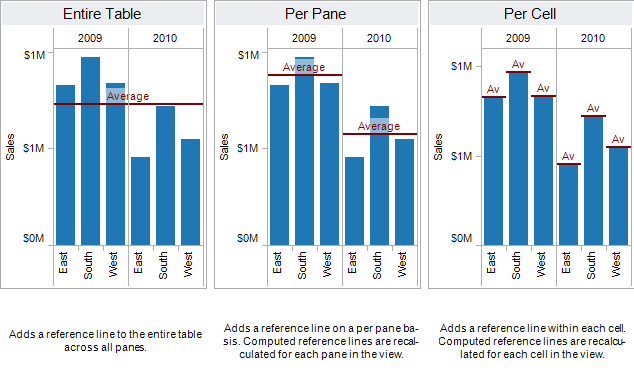 Total - places a line at the aggregate of all the values in either the cell, pane, or the entire view. This option is particularly useful when computing a weighted average rather than an average of averages. It is also useful when working with a calculation with a custom aggregation. The total is computed using the underlying data and behaves the same as selecting one of the totals option the Analysis menu. 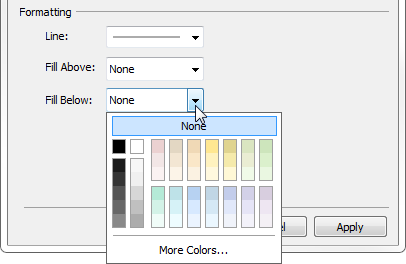 None –select this option to not include a label for the reference line. 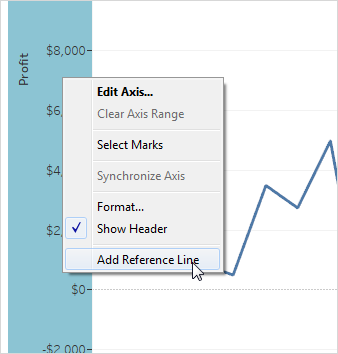 Value – select this option to include a label that is the corresponding value on the axis. Computation – select this option to display an automatic label. The label is based on the computation and the measure that is selected. Custom – select this option to type a custom label into the text box. You can use the menu to the right of the text box to insert values such as the computation or the value. Specify Formatting options for the line. You can change the style, thickness, and color. Optionally, add a Fill color Above and Below the line.